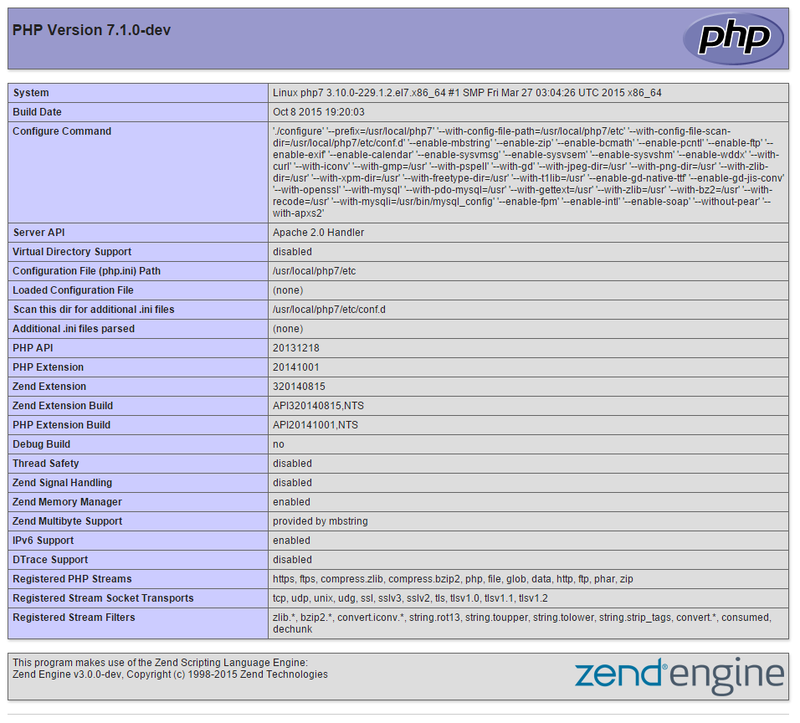 This how-to we will be installing PHP7 with a CentOS 7 LAMP stack. 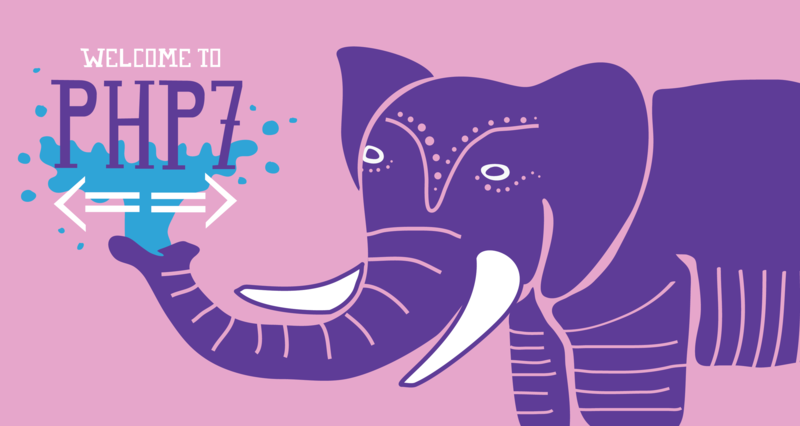 PHP7 is due to release sometime in November 2015, and it is a good time to try out PHP7 and test your code. NOTE: PHP is still in development, do not use this in a production environment, this is only to be used for testing purposes. 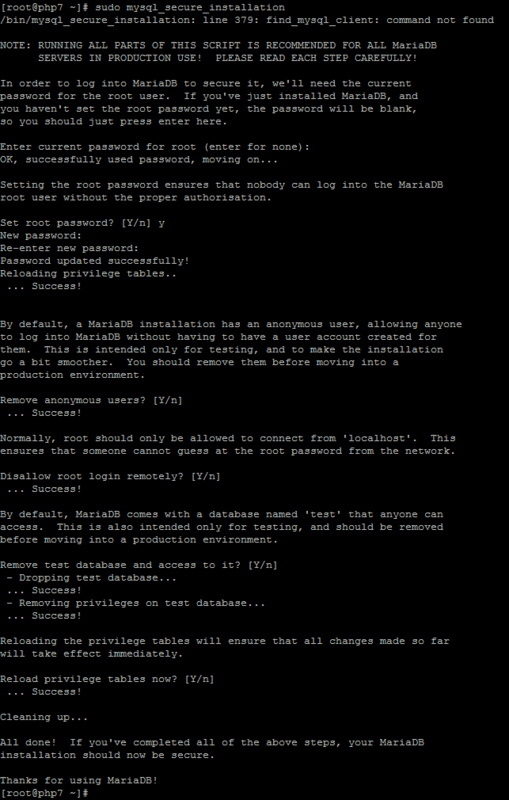 All of the commands we are using require root privileges. If you are using the root user, then you can skip the sudo in front of commands. If you do not have root access to your server, contact your server administrator. To start, we need to take care of a few things before installing Apache. We are going to add the PHP7 repo, go ahead and make the following file with your favorite editor. You will see a prompt that says ‘Is this ok?’ Hit Y and then Enter to proceed. Verify Apache is working by opening a browser and entering the URL http://your-server's-address. 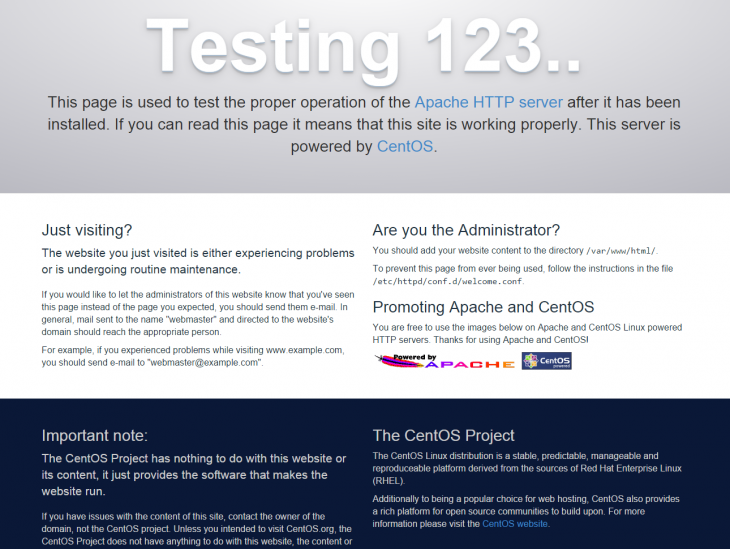 You will get a “Testing 123” page like the image below. An example of ip addr showing eth0 and getting 192.168.100.10 for the IP address. In this example, we would put http://192.168.100.10 in the browser’s address bar. If your testing does not require the need of a database, please feel free to skip this section. After running the above command, you will be prompted to answer a series of questions. It will ask you to enter the current root password, however since we have just set MariaDB up, there should not be one, so simply hit Enter. It will then ask you if you would like to set a new root password Hit Y and then Enter. It will then ask you to enter a password. Use a strong root DB password that is different from any user’s passwords, including the root user. Then re-enter it. From there, you can typically just hit Y and then Enter for each of the next questions, as below unless you need something specific. An example of the MySQL Secure Installation. Using an editor of your choice, open /etc/httpd/conf/httpd.conf and add the following to the bottom of the file. Once added you can then save and exit. Now that we made some changes to Apache, we need to restart, so the changes we made take place. Run the following command to restart Apache. You can then save and exit. Test that PHP7 is working by opening up a browser and going to http://your-server's-address/info.php. Check your PHP version number at the top left corner of the page, it should be higher than 7.0, it should look similar to the image below. Now, that you have verified that PHP7 is working. You should remove the info.php file since it contains information that hackers can use against you. You should see “rm: remove regular file ‘/var/www/html/info.php’?” Hit Y and then Enter. You now have a basic PHP7 LAMP stack on CentOS 7. You can now start placing your site in the /var/www/html/ directory. Congratulations and thank you for following along in this How-To. Check back with us for any new updates or to learn more about our reliable cloud hosting solutions.